Agricultural systems in Australia can be detrimental to the environment. In his highly acclaimed book Dark Emu, Bruce Pascoe argues that reintroducing native plants and animals to Australian farms can contribute to a more resilient and sustainable agricultural future. 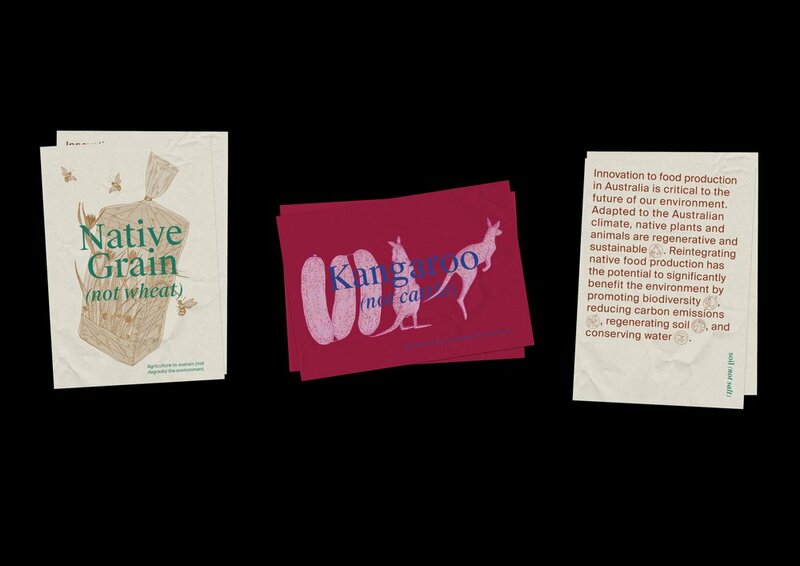 'Soil (not salt)' draws from two branches of visual communication — editorial illustration and information visualisation — to visualise insights from Dark Emu. These visualisations endeavour to mobilise interest and momentum for native food production from a grassroots level. The project contributes to a broader dialogue about innovative approaches to engaging and provocative communication about climate change. Agriculture in Australia is one of the greatest causes of pollution, carbon emissions, biodiversity loss, dry land salinity and drought. And with the compounding challenges of climate change, these issues are only predicted to amplify. In Dark Emu, Bruce Pascoe explores the multitude of environmental benefits that could be gained from farming the native plants and animals that were farmed by The First Australians for thousands of years. Soil (not salt) endeavours to visualise key insights from Dark Emu, making them accessible and engaging to everyday Australians at a time when innovation is critical to the future resilience of Australia’s environment. Soil (not salt) was developed through an iterative process of experimentation and user testing. Through this iterative process, I explored both information visualisation and editorial illustration as methods of communicating scientific information independently, eventually coming to experiment with a hybrid form of visualisation drawing from both.